The right bakery equipment can really make or break your business and that is why you should use nothing but the best for your bakery. Not only will you offer value to your customers, but you will also benefit from energy efficient, effective equipment that will last for decades. You can use rack ovens as part of your bakery offering and allow your staff to prepare a variety of delicious meals to your customers. The very popular Macadams range of rack ovens consists of many models, including the M80ES, the M120 and the M180. The M80ES model is ideal for medium and large bakeries as it offers the capacity to bake 36 dozen pies or 80 loaves of bread at a time. It has a simple control panel and an optional canopy, offering easy maintenance for any bakery owner. You can also choose to M120 rack oven, that features a Smart Controller. This oven has a larger capacity than the M80ES and allows you to bake up to 120 standard loaves of bread and 45 dozen pies. If you run a large bakery you can opt for the M180 oven, which will offer you the ability to bake 180 bread loves at a time, or 72 dozen pies. It also has a Smart Controller and has a platform system with a ramp. You can choose between electrical and fuel execution as well as an optional canopy and auto damper. It has a robust design and allows for easy maintenance. Apart from these rack ovens you can also consider to use the Artisan Range of deck ovens in your bakery or restaurant. The Artisan Macbake deck oven features the Smart Controller, legs that are fitted with castors, a superior steam system and an improved design. The doors are supplied with windows to allow you to see what is happening inside too. This means easy baking and an energy efficient unit that will offer you great value for money. Regardless of the type of oven you choose, modern bakery equipment can make a huge difference in the success of your bakery. 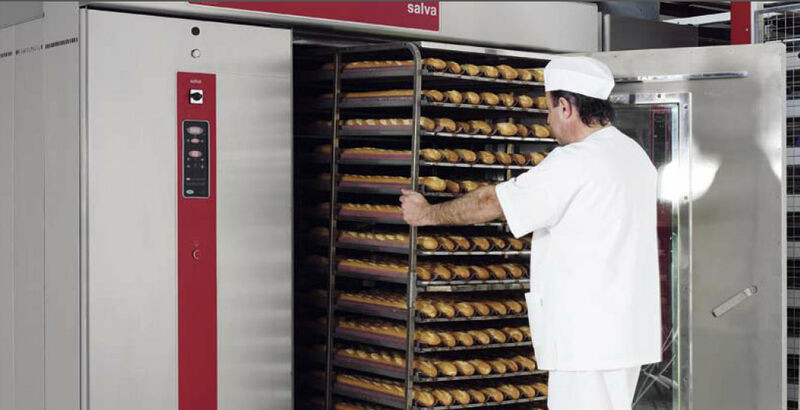 Modern rack ovens are superior and offer a wide variety of benefits to any bakery owner. With the right baking equipment you can enjoy preparing a variety of meals to your customers and improve the quality of the food items you are offering. Macadams specialises in rack ovens and our equipment is cost effective and energy efficient. Contact us today to find out how we can help you get the best equipment for your bakery and offer your customers excellent value.